Mayor Lianne Dalziel (l) and Recovery Minister Megan Woods. 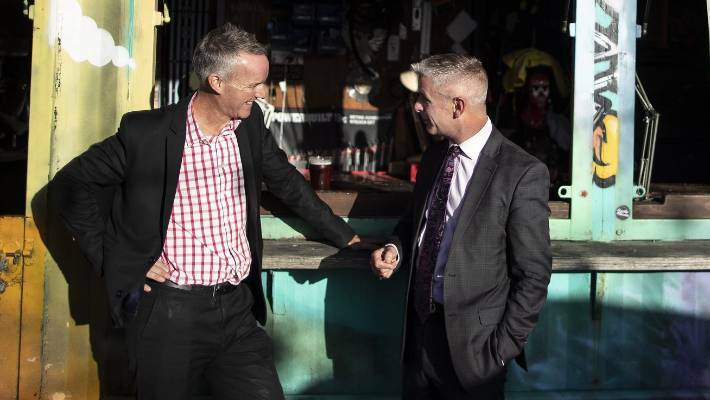 The two old friends will be haggling over the millions still at stake in Christchurch's recovery. 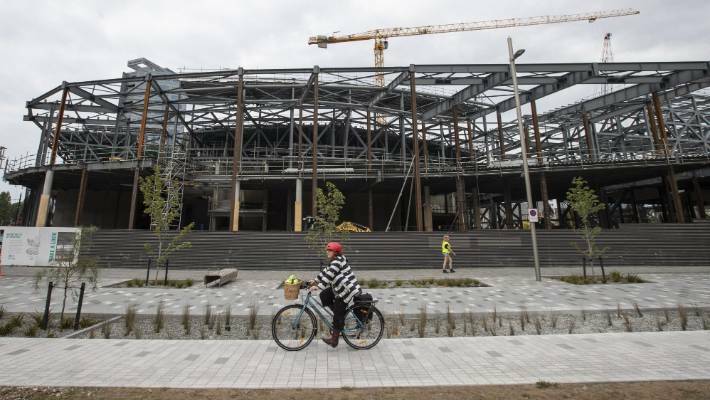 Could Christchurch City Council refuse to take the new convention centre off the government's hands? Welcome to the global settlement, the final wash-up of earthquake costs between the council and Government. John McCrone reports. Here we go again. Council and Crown are meeting in tense, closed door negotiations to figure out how to split the multi-billion dollar bill for Christchurch's earthquake recovery. There was the original infamous cost share agreement back in June 2013 between a Christchurch City Council (CCC) led by Mayor Bob Parker and a National Government represented by Recovery Minister, Gerry Brownlee. 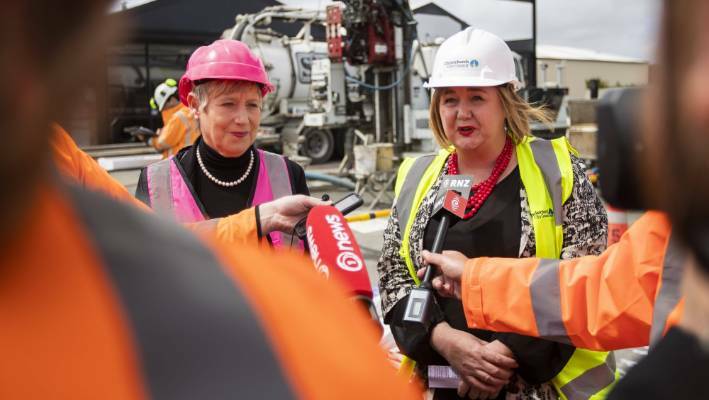 The two were almost at war, with Brownlee pushing a set of super-sized anchor projects for the city, and the council feeling not enough was being spent on fixing Christchurch's broken horizontal infrastructure – its roads, water mains, stormwater pipes and sewers. * Passing the baton: Christchurch drifting while its power questions unanswered? * How much is the Government really spending to fix Christchurch? After much grumpiness, a deal was signed on a near $5b package of work, with the bottom line being Christchurch's ratepayers carried $1.9b of the tab, the nation's tax-payers the other $2.9b. Now it is that time once more. The 2013 cost share set the broad terms of the financial arrangements. This year, council and Crown want to conclude a final exit agreement – a global settlement – which will cover off remaining expenses and also transfer political power back to the city. Or as Deputy Mayor Andrew Turner puts it: "Normalise our relationship with Wellington. Get government out of town – in the nicest possible way, and on the best possible terms." And you might think concluding a wrap-up deal should be considerably easier. There is a new government in charge now, and a new Regeneration Minister in Labour Wigram MP, Dr Megan Woods. But this is politics. And Treasury will be running its cold eye over every line of any agreement. It is also a coalition Cabinet – many of whom may be thinking Christchurch has benefited plenty from the public purse as it is – that will be signing off on the Crown's side. And insiders are warning the council's team wasn't exactly crash-hot at arguing the city's case in 2013. Chris Mackenzie, a senior Canterbury Earthquake Recovery Authority (Cera) official involved in those talks, says while Wellington sent down a small, crack negotiating team with Cabinet-mandated bottom-lines, CCC's response was by contrast "scattered". "The right people weren't in the room," Mackenzie says. Going public: Deputy Mayor Andrew Turner (r) and CCC's Brendan Anstiss (standing) prepare to brief the Tuesday Club. "Get government out of town – in the nicest possible way, and on the best possible terms," explains Turner. And with the global settlement largely taking place in closed meetings – again no chance for the public to cry foul on the positions being pursued by either side – there is a considerable risk of the city being strong-armed a second time. Mackenzie says a lot of the headlines will be about the wash-up on anchor projects, like the convention centre, stadium and bus exchange. There are millions in future liabilities that could go either way. But bigger money lies in decisions on responsibilities for the city's un-sorted horizontal infrastructure (HI) and land drainage issues. The unflashy stuff, Mackenzie says. Then there is the huge question mark hanging over the future of the Avon River Corridor residential red-zone (RRZ). CCC could be left holding the tab on recovery costs that might only become apparent in the city's budget in another 10 or 20 years. Mackenzie says the council will have to be at its sharpest to get a good outcome on such a confusion of issues. "Both sides need to have determined what it is that they are going to bring to the negotiating table before they get there," he says. 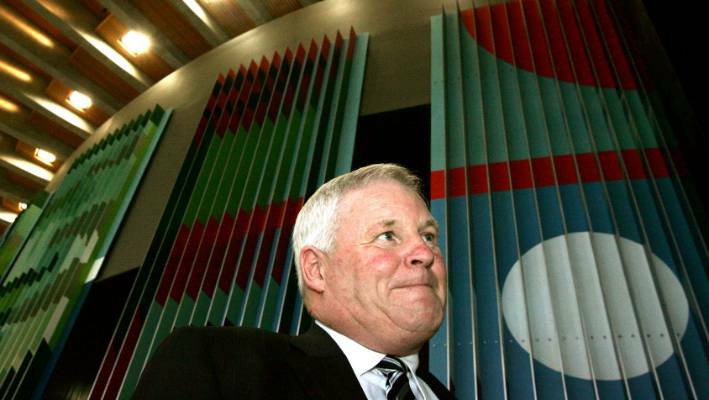 There are those, like former Mayor Garry Moore, who are on high alert at the possibility Christchurch might well get "done" a second time. Through his own political talking shop – the Tuesday Club, which he holds every week at his son's central city Smash Palace bar – Moore has been doing his best to flush out any hidden agendas. 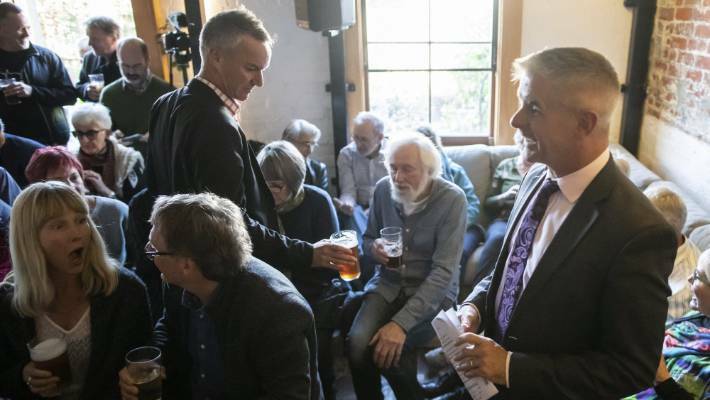 It was at a first packed-out meeting at the Tuesday Club in March that Mackenzie, along with recovery pundit, accountant Cam Preston, spoke of their concerns about the global settlement process. Then in April, Cr Turner, accompanied by CCC strategy chief Brendan Anstiss, showed up to present the council's side of the story. Moore says the central complaint is the city ought to have been hearing much more about these crucial talks already. The negotiations seem so secretive that there isn't even a published timeline to tell whether they have started or when they might finish. Partly that is because of a certain embarrassment. The two key parties, Mayor Lianne Dalziel and Megan Woods, had thought they would be getting straight into it early in 2018, almost immediately after the Labour coalition's surprise election victory. Woods had said a full and final deal was her priority as the new minister. Labour had also promised Christchurch the most cash during the election campaign, with its $300m capital acceleration fund. Treasury man: Chris Mackenzie - here in old job of delivering budgets – warns CCC must bring its A game. But Dalziel says the global settlement was put on ice last year as Woods first had to focus on getting that $300m vow past a Cabinet which included NZ First colleagues with their own big ticket election promises to promote. Yet how the global settlement will progress still feels somewhat fuzzy around the edges. It could go fast, it could go slow. Speaking for the council, CCC's Anstiss told the Tuesday Club that preliminary officer-level meetings got going late last year. Those are now getting more intensive. Anstiss says the goal is for him to come back to councillors with a deal ready to sign by early June – in time to be reflected in this year's Long Term Plan budget, and before local government election campaigning gets rolling. That way, voters will have clarity about exactly where Christchurch stands on its remaining recovery costs and intentions, he says. However, Woods says there are no firm deadlines for the process. There remain an immense number of complexities, so it could get tricky. Woods points out the previous government was meant to seal an exit deal back in 2017, but only managed a minor "refresh" to the cost share. "It parked the more difficult issues to one side." And she says getting the right result for Christchurch rather than rushing the decisions still has to be the main consideration. "It would be great if it could be [completed before the local elections], but there's no formal timeline we're working to." As would be expected, both council and Crown are vowing that it won't be about the money or power games. Officials will be putting aside any differences to achieve an outcome which is the best for the city. Woods says she wants a comprehensive agreement – one that covers every part of the equation, from anchor projects to red-zones – so the talks are taking a holistic view on how to keep Christchurch's recovery moving. There will be trade-offs as a result. Crown may have to yield on some things, the council on others. But that is better than tackling each element as its own isolated battle. "I gave some pretty clear directions to officials on the Crown's side that this wasn't just a transactional, 'shifting things about on the balance sheet', exercise. It's about a pathway to local leadership, planning for the future, and enduring relationships," Woods says. However Mackenzie – a former Treasury budget drafter, Auckland supercity and Toll Rail negotiator, as well as a Cera insider, and now chief executive of Development West Coast – was frank at the Tuesday Club about his misgivings. Mackenzie says the Crown team will know it has to take back a settlement which Woods can get past Cabinet. There will be no playing soft with taxpayer funds. And the last cost share showed how it could be a very unequal negotiation. The council still looks lightweight and lacking crucial information to argue the true long-term costs on some of the recovery issues. Mackenzie says to understand what is at stake with the global settlement, you need to understand the dynamics underpinning the 2013 cost share. That were really two discussions. The first was about Christchurch's infrastructure bill. 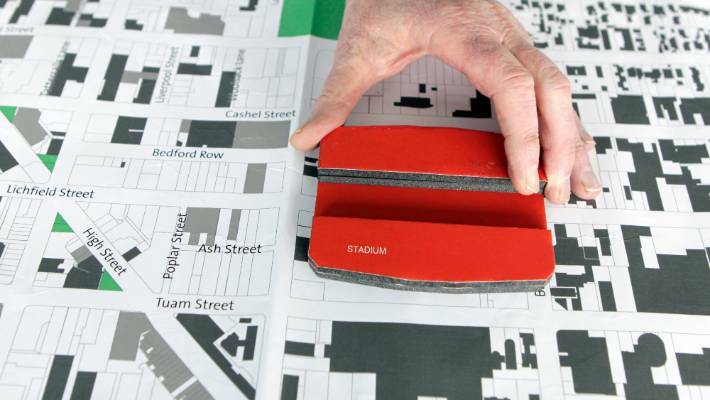 Super-sizing: The 2012 Blueprint dropped big bits of civic furniture, like the stadium, into the CBD. Under civil defence legislation, there was a recognised division of the cost of fixing underground services, with the Crown responsible for 60 per cent of the expense, council 40 per cent. On roads, NZTA had to cover 83 per cent. But that obligation was only to repair to the level of service that existed pre-quake. And sufficient to get the city functioning. It was not to give Christchurch a whole set of new pipes and roads. Mackenzie says CCC didn't seem to understand this distinction. Indeed, it turned out not to have the asset management plans that could tell Cera how old, or in what actual prior state, anything was. It had never created those records. "We were landed with an organisation that couldn't give – immediately after the earthquakes – the information we were looking for." The result was a confused period in which government signed off on expensive complete fixes for every road it got started on. But as it became clear the final HI bill was going to be huge – soaring from an initial estimate of $2.2b to nearer a $4b total – the Crown had to apply the brakes. As part of the cost share, it was decided repairs would shift to being done on a "network" basis – just what it took to get Christchurch running. And then unilaterally, the government capped its liability at $1.8b – its estimate of what should be spent. CCC protested this was about $250m light of what was really owed the city. There was a subsequent independent review, but essentially it became case closed for the council on that aspect of the cost share. The anchor projects – the Blueprint redesign of the central city – was a different kind of story, says Mackenzie. As is well-recorded history, impatient with the council, Gerry Brownlee felt Christchurch needed to show greater ambition in its rebuilding of the city's devastated core. Through Cera, Brownlee took over control of the central city masterplan and forced CCC to agree to a collection of "super-sized" civic assets. A giant convention centre in Cathedral Sq. A covered rugby stadium in Madras St. A new QEII Olympic pool and leisure centre taking up a cleared block near Hagley Park. Brownlee broke the news of these budget-busting projects to the council at a hastily convened meeting at the Canterbury Club, barely days before Prime Minister John Key was to announce them live on TV. However Brownlee assured the assembled councillors that commercial interests would pick up much of the costs for projects like the convention centre and Metro Sports Facility. And to the council's advantage, during the resulting cost share negotiations, it was CCC's maximum contribution on many of the larger Blueprint anchors that was capped. The government's side of the funding equation was left open, Mackenzie says. Picking up on this point at the Tuesday Club, Cam Preston says CCC did let the ball drop on infrastructure. There was some inept bargaining there. 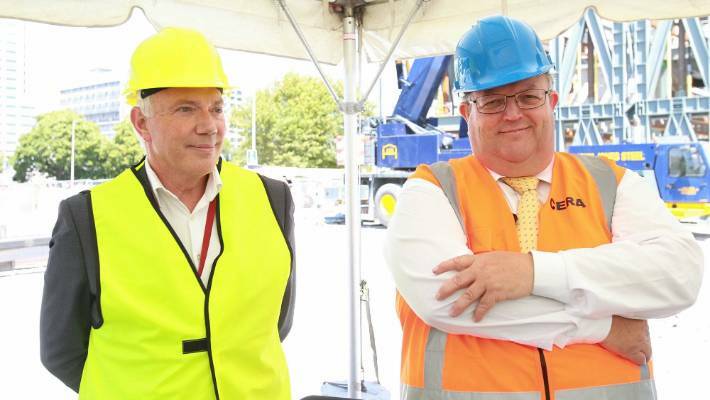 How it was: Mayor Bob Parker (l) and Minister Gerry Brownlee putting brave faces on a strained relationship. Preston says ahead of the cost share, the government had pencilled a potential HI liability of $2.4b into national budgets. "Six months later, after the cost share agreement had been signed, that had been reduced to $1.8b." So given CCC should have been able to see exactly what the government was expecting to spend if pushed, that was $600m it let slip away, Preston says. This tallies with Mackenzie's description of the council as being rather lightweight when it comes to dealing with Wellington's slick professionals. But Preston says CCC now has the power on its side with the anchors. On the new central bus exchange, for instance, the cost share capped the council's contribution at $23m – what it had budgeted for a replacement before the Blueprint came along. The Crown took the project over and eventually delivered a building costing about $79m in total. Preston says at the moment, the Crown still owns and operates the bus exchange. It pays the running costs of $1.5m a year. It is liable for the depreciation and long-term maintenance expense as well. In the global settlement, the Crown will want to hand the bus exchange over. It makes no sense Wellington being in day-to-day charge of Christchurch's main bus stop. However a street-wise council should be arguing that it was the government's Blueprint that cranked up the scale of the project – paid for its elegant design, but also super-sized its long-term upkeep costs. So really it is up to the Crown to make it worth the city taking this asset onto its books, Preston says. There ought to be an operating subsidy built into any hand-over. Certainly CCC shouldn't be bamboozled into paying a dollar more than the cost share agreement. "If we can get a bus exchange worth $79m for $23m, then let's go ahead and do it." The possible horse trading becomes clearer when seen from this perspective. The council still likely feels underdone by hundreds of millions of dollars on the original horizontal infrastructure split. But in the current wash-up, it can look to win back something because it may have the upper hand on a few of the anchor project liabilities. Te Pae, the new convention centre, is a particular example. During the cost share, the council managed to dodge responsibility for its funding. It was one of Brownlee's flagship ambitions. Brownlee said that was OK. The Crown would find commercial developers to build and own it. However, that plan fizzled and eventually the Crown had to stomach spending upwards of $475m to get it done. The opening is next year. A city rises: The convention centre is the showpiece. But does council want to own the operating costs and depreciation? Preston says now the government will want to shift Te Pae off its balance sheet. But why would CCC take it even as a gift? As owner, it would inherit the building's equally heroic operating and maintenance costs. The annual depreciation on such an asset could be $7m alone. Then there is the risk it may run at a considerable loss if the forecast conference traffic never turns up. Chipping in, Garry Moore says CCC struggled to get its own modest $20m convention centre to pay for itself pre-quake. Keeping Te Pae's doors open could become very expensive. "If I were on the negotiating team, I'd say to the Crown, well you built it, you run it." So it sounds a good argument. The Blueprint loaded some costly-to-own assets on Christchurch. The anchors are rather grand civic buildings for a city of its size and rating base. Justice might be served if the Crown recognises that fact as part of any full and final settlement of Christchurch's recovery bill. However, addressing the council's tactics, CCC's Anstiss replies that sadly life is more complicated than that. Anstiss admits it is frustrating that a line was drawn under HI costs and the city's post-quake land drainage issues – the increased flood risk. There won't be much on the table concerning those. However, while he will be arguing for more government money – the $300m capital acceleration fund only makes a dent in what Christchurch still expects to get, he says – Anstiss agrees with Woods the focus must be on the bigger picture. As Turner says, the council's goal is first to normalise its relation with the Crown – to be a city like any other in owning its own convention centres, bus stations, stadiums and other civic facilities. And then both council and Crown need to concentrate on what further has to be done to keep Christchurch's earthquake recovery rolling. Anstiss says the city needs public certainty about its direction for investors to keep investing. It can't afford to have local and central government trying to game each other on the cost of agreeing a sound exit deal. So the city's horizontal infrastructure might be only patched. But it does work and is not a blockage to the recovery's momentum. It isn't the bit affecting long-term confidence. On the other hand, any new uncertainty about the convention centre or stadium could derail progress. It is better they are completed as advertised and then run as competently as possible. Christchurch doesn't win if the convention centre stands empty, even if it is Wellington picking up the expense. Anstiss says CCC is doing its due diligence on the anchors to make sure it isn't taking on any unwarranted operating costs. "But the Crown is committed to the same outcomes. They want the best for Christchurch as well. There's not a sense we're trying to screw each other on these things. There needs to be compromise on both sides." Cr Turner agrees. "The perfect result is one we may never get. I would rather get speed, certainty and a good result. And that as soon as possible," he says. So the council isn't holding its breath for a missing $600m, or whatever would plug the gaps in an HI bill still hanging over Christchurch. And realistically, CCC wants to own the civic anchors just as much as the Crown wants to be shot of their operational complexities. Ready for the fray: CCC's Anstiss (l) and Deputy Mayor Turner prepare to face the crowd. Another sore point that will be discussed during the global settlement is the competing regeneration agencies which the 2016 Greater Christchurch Regeneration Act created. CCC wants all the rival agencies collapsed into a single entity under its control. Woods' reply is the existing legislative structure will likely last until its official expiry in 2021. However, unlike last time, she says the global settlement can be a vehicle to sort out the plan for that next stage well in advance. "I want us to use this opportunity to make sure we start plotting out exactly what that pathway looks like." That leaves the last sticky issue of the Avon River Corridor red zone. The 2013 cost share left almost all the important questions on that open. And while Regenerate Christchurch spent several years of exhaustive consultation to formulate a plan, Woods and Dalziel cut the process short last year before it could deliver on its detailed advice about appropriate ownership and funding arrangements. Again, potentially hundreds of millions of dollars are at stake to achieve the ambition of turning the red zone into a mix of public park, flood protection and eco attractions. So that may become the best test of whether Mackenzie is right in his warnings about the need for CCC to be on its game. Has it done its homework so it can press a proper case with the Crown? Anstiss is talking about due diligence, but also a desire to get the global settlement through in the next couple of months. The red zone is just the sort of asset the city could wind up owning with huge future unrecognised costs. By June, there may be answers on exactly how skilfully those lines were drawn.